Screenshots help us in many ways whatever we may need it for. I use it when I am troubleshooting with some support helpdesk, when building websites, for blogging, etc. Windows has the basic Print Screen option that you could load up in Paint and just crop the area you want. I did that for a long time. Then, I started using an excellent Firefox extension – Screengrab. It worked great for screen captures within my browser. But, I couldn’t take screenshots of my desktop or other applications or even other browsers. 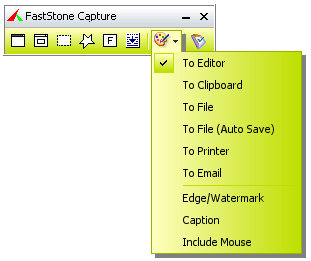 That’s when I stumbled on this awesome little screen capture utility, FastStone Capture. In fact, I have been using this for over a year and I just realized that I haven’t reviewed this gem of an utility that has been my friend for a while. So here are some of the things it can do. Capture anything in your computer and let you save in multiple formats such as jpg, gif, png, bmp, tga, tiff, pdf, etc. You can capture windows, active window, objects, full screen, any rectangle region, free-hand selected regions, scrolling windows and web pages. Options to send the captured image to the built-in editor or clipboard or to a file or to printer or to email. The built-in editor is great for resizing, adding watermark/shadow edge or adding a caption. Add effects such as grey scale, sepia & negative. You can add annotations to the captured image or draw arrows and shapes to illustrate your point. You could set a filename template for your screenshots and even automatically save images to an output folder. FastStone Capture fires up when I start my computer and I use it all the time for these various tasks. In fact, in spite if being a screen capture utility, I tend to use it a lot for quickly resizing images, adding edges, etc a lot. Plus, the color picker also works great when I am looking up colors from places other than my web browser. Inside Firefox, nothing can beat Colorzilla for me. What does FastStone Capture cost? FastStone Capture’s current version is available at $19.95 for a lifetime license at the moment. It used to be free until version 5.3 and switched to a paid application. The features I mentioned above are all available in the free version and the newer paid versions have even more powerful features. You won’t go wrong with this utility no matter which version you choose. I have found version 5.3 more than adequate for my needs but wouldn’t mind shelling the $19.95 for lifetime license should I need the additional features. I have recently come across another excellent screen capture utility that I will be reviewing shortly. So stay tuned. What is your favorite screen-capture utility? And what is your common gripe about it? It sounds like a great application – I guess the only place I can think of using it would be when making a step by step tutorial on how to do something on the computer. Thanks for the tip. I have been using Screengrab, too, but didn’t like the fact it couldn’t help me with Windows programs. Yes, It’s correct what you have written in the blog,Donwload Inzomia image viewer from http://www.izview.com, its free. Open the web page in the viewer’s browser windows and click “as image”. You will save the complete web page even the part of the page that needs scrolling. Looks pretty decent! Maybe I should give it a run too! SOunds like a good platform. I’m gonna take a look at it. This looks like a great program. I’ve been using SnagIt, but this one looks like a great competitor. Do you know if this will work on Mac OSX? I just switched to Mac, and have not figured out how to do screenshots yet. Kermit, I am not a Mac user and I am sure there are other nice utilities for Mac. Lifehacker.com could be a great place to find such stuff for Mac. Thanks again K. I downloaded it and have been using it often. It’s brilliant for capturing bits of screenshots to add to a blog post (and instantly adding a nice dropshadow). I still open them in Photoshop and Save for Web, to optimise them, but it’s made the whole process much quicker. Jon, I do the same and it is something I can’t live without. Is there a lot of size diff between FSCpature’s output and the output from ‘Save for web’ option in Photoshop? Any screen shots of this thing in action? as for me I’m still using screengrab in spite of a great deal of the disadvantages. Thank you for some additional information on this point.